Four first-half goals was enough to earn Buckie Thistle a comfortable home victory against Fort William on Saturday, despite a dogged display from the visitors. 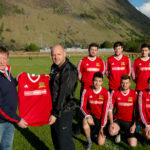 The Fort travelled east without a number of important players in the squad, including forward John Treasurer and defender David McGuirk, but the young team were determined to stick to the task and frustrate their opposition in defence. However, the Jags took the lead early on after Lewis Campbell turned the ball into his own net after getting his head on a cross into the box. The home side’s second came in the 19th minute when Declan Milne shot from the edge of the 18-yard box. Milne was on the scoresheet again soon after and he provided a great finish after a slick Buckie passing move to make it 3-0. Steven Ross made it four for the Jags before half-time as his close-range strike couldn’t be kept out of the net by the Fort’s traillist goalkeeper Finlay Burstow. After half-time, the Fort were far more solid at the back and managed to prevent the home side from scoring again. However, they lacked that same spirit and resolve in attack and the forwards found it difficult to test the Jags’ goalkeeper. Buckie saw out the 4-0 victory, which was comfortable in the end for the league’s seventh-placed side. Fort William remain rooted to the bottom of the Highland League table. The Fort are back in league action on Saturday December 15 when they take on Huntly at Claggan Park.